I2C Knobs now in stock! Problem: Rotary encoders are cool but hard to wire into your projects. Solution: Makernet Knob puts a rotary encoder with RGB backlighting into your project as intuitive daisy-chainable I2C device. Ever played with an "infinite" knobs on your car radio that keep spinning in either direction? These special knobs are a form of "rotary encoder", a device that translates the rotational movement of your fingers into a series of digital special pulses. Rotary encoders are super-cool and add a bit of pizzaz to any project. They make for a great tactile experience far better than up/down buttons or joysticks. I think every project deserves a rotary encoder and I've used them in many of my own creations. Sadly, rotary encoders are not simple to use. In fact, they can be downright complicated. You have to stick them on special interrupt pins and tweak and tune the libraries and capacitors just right to get good results. And adding more than one dial to a single project can be an complex chore that could potentially involve logic probes and interrupt remapping. Yuck! Well, hackers of the world, suffer no longer! 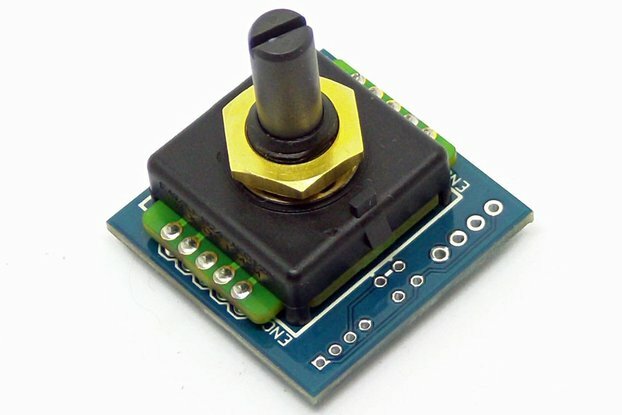 The Makernet Knob takes the infinite twirling goodness of a traditional rotary encoder (with its complex pulse train) and provides you with a dead-simple, daisy-chainable I2C interface. For those new to the scene, I2C is a simple and easy-to-use bus that you almost certainly already have on your maker boards. In fact, nearly every microprocessor from the Raspberry Pi, ESP8266, AVR/Arduino, and even the popular Teensy boards supports I2C. With the Makernet Knob, you just connect up four simple wires and suddenly a beautiful encoder with a controllable RGB LED and pressable-select button can join your project with a minimum of fuss. Uses plain old I2C available on any microprocessor; no special pins, interrupts or real-time code needed. Pre-made libraries and test code with plenty of examples. Tested with Arduino, Teensy and Raspberry Pi. Put literally hundreds of knobs into your project without any extra hassle. Transparently compatible with 5V and 3.3V logic, with built-in "level shifting." The encoder is made of a transparent shaft that can be lit via three PWM channels to any desired RGB value. Pressing the encoder triggers a switch which can be used to select items or trigger any other action. All of the logic to de-noise and de-scale a rotary encoder is done for you - you just make a few simple library calls in your sketch. Easy to mount in a project using a XXXX mm drill hole. 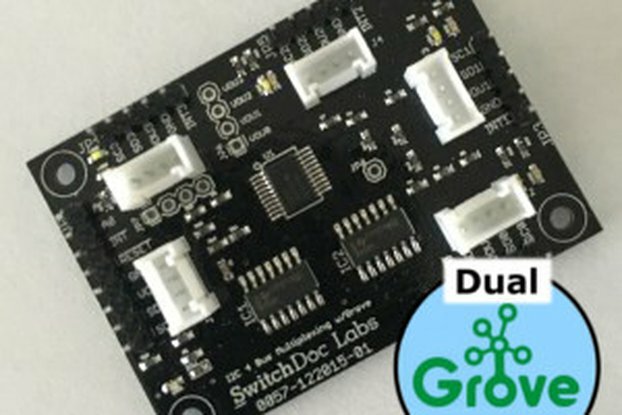 Contains special code that lets you set it to any I2C device address allowing you to daisy chain and avoid I2C address conflicts. Built by a Maker just like you! Use it in place of a regular potentiometer knob for more precise and fun control of a counter or project setting. Implement a Left-Right-Left safe that only unlocks when the right numbers are selected. Give your next clock project a super cool way to set a timer or alarm. Build your own midi control surface! The Makernet Encoder has only four pins: VIN (3.3-10V), GND, SDA and SCL. A tiny (and super inexpensive) microprocessor is integrated on the board and takes care of all of the rest. Be sure to install the Arduino IDE library and check out the various examples below for more details. I love building cool interactive projects and have frequently suffered the royal pain of integrating rotary encoders. I've resolved from this day forward no one else should have to go through that pain again! 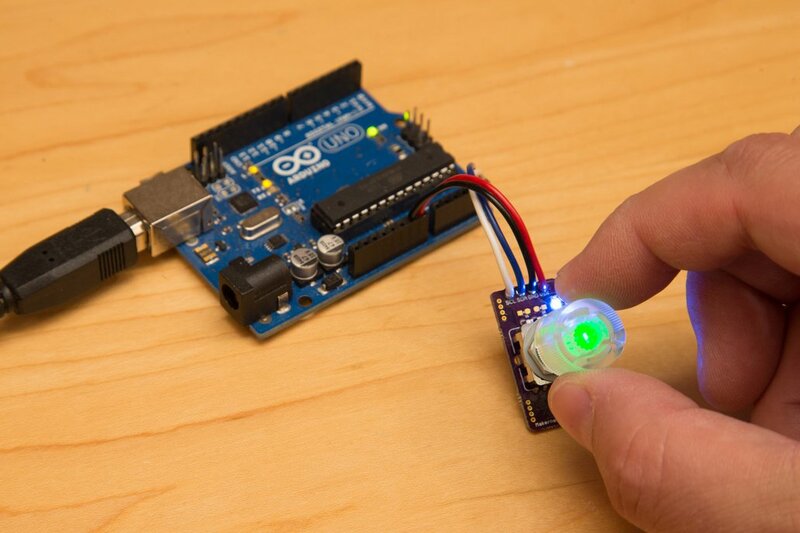 See the github repository for the Arduino Library, installation details and more! I try to ship orders every few days. The product works well as expected, nice job. No problem, connected ad work, I have integrated in my project without any issue. The easiest way to add rotary encoders to your project. These are the knob's you're looking for! It took literally five minutes to get them connected and working with my project. The build quality is excellent. The documentation is clear and concise. The sample applications work. Absolutely no complaints. If you've ever tried to integrated raw rotary encoders into a project you know what a pain it can be - hardware debounce, software debounce, convert pulses to values, etc. The Makernet knob handles all of that for you. The API allows you to check for changes, read a simple numeric value (which you'll generally use just to determine increment vs. decrement), and respond to both press and release events on the push-button. I really hope to see more interface components from the Makernet Simple line. Thanks! Wow Steven - thanks so much for the review!